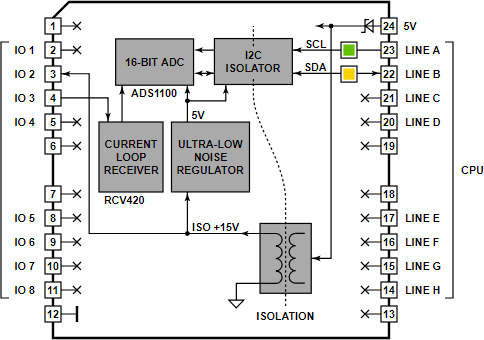 This ADC Tibbit uses an RCV420 current loop receiver front-end and an ADC1100 16-bit analog-to-digital converter IC. To lower noise and improve resolution, this Tibbit has its own isolated power domain. The full-scale conversion error for this Tibbit does not exceed 2%, and the effective flicker-free resolution is 15 bits. Combine this Tibbit with #21 (four terminal blocks), #20 (nine terminal blocks) or #19 (DB9M connector). It's not common but possible to use the latter for wiring into the meter's inputs. There is one red and one yellow LED. The red LED is connected to the SCL line of the I2C interface; the yellow LED – to the SDA line. The use of this Tibbit is illustrated by a Tibbo BASIC test project. 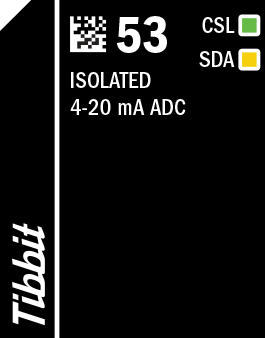 You can find it here: https://github.com/tibbotech/CA-Test-Tibbit-53.